Almost without fail, Indianapolis Colts quarterback Peyton Manning spends part of his postgame post-mortems talking about the ways opponents try to take away tight end Dallas Clark. They play nickel (five defensive backs) or dime (six DBs). They double-cover him, using a linebacker and a defensive end, or another unusual pairing of defensive players. Some clubs have tried straitjackets and cluster bombs, with varying levels of success. Since Clark emerged as one of the league's most dynamic weapons three or four years ago, defenses have spent the week leading up to Colts games saying, "We've got to make Dallas Clark disappear." Well, Clark has disappeared, courtesy of a season-ending wrist injury. Which means this: There's even more pressure now, if that's possible, on Manning. If No. 18 can lead his team past Houston in a Monday night monster game at The Luke, if he can overcome the injuries to Clark, receiver Austin Collie, running backs Joseph Addai and Donald Brown, and receiver Anthony Gonzalez's tenuous return from injury, and lead this group to another 12-win season, he should not only get his fifth MVP, they should rename the trophy after him. "You still have the same expectations, but you may have to make some adjustments," Manning said Thursday. 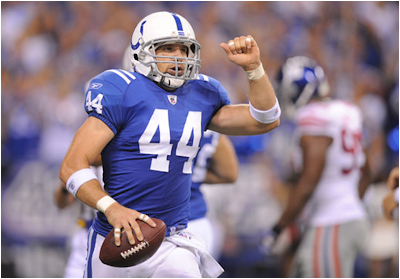 "To sit here and say there's not an adjustment without Dallas Clark, we can't say that. He's too great of a player not to have an effect." Outside of the 2008 season -- when Manning's bum knee left the Colts 3-4 before a nine-game winning streak -- has Manning ever faced a bigger challenge? It doesn't take a coaching legend to break down the obvious X's-and-O's ramifications of Clark's loss. With Clark in the lineup, most defenses have used five or six defensive backs, daring the Colts to run the football -- which they have done with uneven success. Unless Jacob Tamme emerges as Dallas Jr., defenses will pay less attention to the Colts' tight end, meaning more emphasis on closing down the outside receivers (Reggie Wayne, Pierre Garcon, Gonzalez) and/or more emphasis on shutting down the run. In 2006, the Colts went 11-1 with Clark in the lineup. When he went down with a knee injury, the Colts finished the season 1-3, although a lot of the blame fell on the porous run defense, which got shredded by Houston and Jacksonville. When Clark came back for the postseason -- thank heaven for medical second opinions -- the Colts didn't exactly light up the scoreboard, but Clark was their best weapon on the way to a Super Bowl title. "It's going to be different than 2006 because we've literally seen a change in the way teams defend Dallas now," Manning said. "Since he's established himself as such a threat in the slot, at tight end, in the backfield, he's become even more versatile. The last four years, teams are using nickel, using dime, double-teaming him with a defensive end and a linebacker; we just didn't see it back then. "Now the real question is, 'Do they continue to do those kinds of things or do they totally change what they do?' Dallas has just been so awesome, he's made defenses think a lot more." We've already seen how different the Colts looked in 2006 when they lost Clark for a month. This won't all be about Manning, although he's always at the center of things. Gonzalez needs to come back with a strong performance and re-stake his claim as part of the team's long-term future. The defense has to step up and consistently take more ownership of a team whose offense has been wracked by injuries. And the offensive line, which has improved markedly since that opening-game mess in Houston, has to play its best game of the season in run and pass blocking. There also can't be any slippage in special teams, an area that tends to suffer the trickle-down effects of front-line injuries. There's no punter/kickoff man/holder Pat McAfee -- and his suspension now makes more sense with the knowledge that coach Jim Caldwell laid down the law on off-field shenanigans right before McAfee's late-night swim. This isn't a must-win; those don't come until a loss means the end of the season. But it's really, really close. They can't afford to go 0-3 in the division and two games behind the Texans, factoring in the tiebreaker. It's not going to be easy to reach the playoffs as a wild card this year. How about "next men up?" And this just in: John Mackey isn't walking through those doors anytime soon.